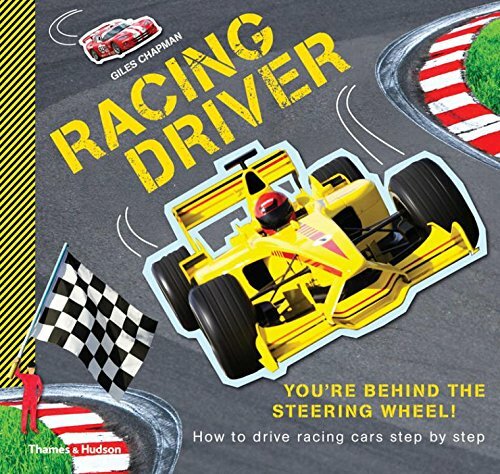 Any parent or caretaker who ever had an exuberant son or daughter with a need for speed is sure to love the new picture book, Racing Driver: How to Drive Racing Cars Step by Step by motoring journalist Giles Chapman. Racing Driver is a detailed learning manual that guides and encourages prospective drivers to begin their racing careers with a well-rounded racing education, beginning with studying and testing out the much safer Go-Kart before they proceed to the racecar. There are bright and colorful graphics that teach the various parts of the Go-Kart, where children should place their feet, how to locate the engine, and where to find the gas and brake pedals. There is also a meticulous guide that encourages being safely “suited and booted,” paying attention to safety rules, judging corner turns, and even handling bumps and spins. From this humble Go-Kart beginning, children over age 16 are then mentored on what it’s like to take the wheel of an honest-to-goodness racecar. There are safety checklists, control diagrams, racing tips and tactics, and even a section on driver safety. This book is designed to be a thorough course in speed racing for children. It Includes information on historic racing, Formula I, NASCAR, and IndyCar racing—everything a young racer could ever want or need. There seems to be only one shortcoming: There are no statistics on Go-Kart or racing car injuries or the most common types of accidents that children might incur while operating either car. The section on driver safety does include a photograph of a racecar fire, but it only explains that a pit crew is trained to deal with this emergency. It does not explain how to avoid such an accident or what to do if it occurs. Although accident statistics may seem ominous, they could further prepare young drivers for a safe driving experience and provide a more well-rounded education in speed racing. Chapman’s text is age-appropriate and matter-of-fact. His writing sidesteps the so-called glamour of racing and instead stresses parts, safety, and other information that is vital to safely and successfully participating in a car race. The illustrations include a careful blend of kid-friendly illustrations and actual racing photographs that keep readers interested from start to finish. There are also charts, graphs, pictures of famous racing cars, and pictures and short bios of the drivers who raced them to victory. An exciting addition to any Go-Kart or car racing organization or any interested child’s personal library.